Purpose: To examine the usefulness of three types of benchmarking	for interpreting patient outcome data. Design: This study was part of a multiyear, multihospital longitudinal survey of 10 patient outcomes. The patient outcome used for this methodologic presentation was central line infections (CLI). The sample included eight hospitals in an	integrated healthcare system, with a range in size from 144 to 861 beds. The unit of analysis for CLI was the number of line days, with the CLI rate defined as the number of infections per 1,000 patient-line days per month. Methods: Data on each outcome were collected at the unit level according to standardized protocols. Results were submitted via standardized electronic forms to a central data management center. Data for this presentation were analyzed using a Bayesian hierarchical Poisson model. Results are presented for each hospital and the system as a whole. Findings: In comparison to published benchmarks, hospital performances were mixed with regard to CLL Five of the 8 hospitals exceeded 2.2 infections per 1,000 patient-line days. When benchmarks were established for each hospital using 95% credible intervals, hospitals did reasonably well with only isolated months reaching	or going beyond the benchmark limits. When the entire system was used to establish benchmarks with the 95% credible intervals, the hospitals that reached or exceeded the benchmark limits remained	the same, but some hospitals had CLI rates more frequently in the upper 50% of the benchmarking limits. 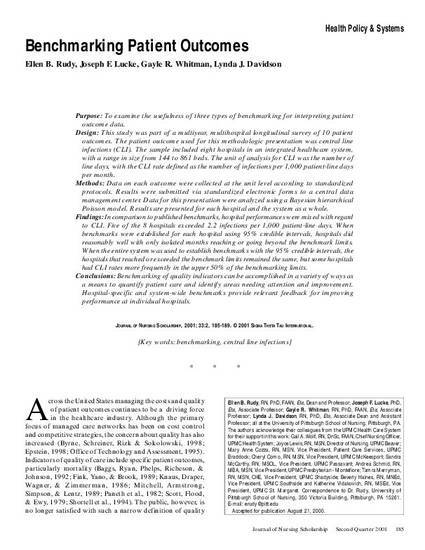 Conclusions: Benchmarking of quality indicators can be accomplished in a variety of ways as a means to quantify patient care and identify areas needing attention and improvement. Hospital-specific and system-wide benchmarks provide relevant feedback for improving performance at individual hospitals.